I'm testing Memory Profiler with an app at my company, so far so good. I found in my app that I have a lot of difference between Total and Held instances (sometimes 1 vs millions). Is this a problem I should be taking care of? I've read documentation but didn't find anything about this "issue". "Held instances" are instances that are prevented from being garbage collected by the item (instance, type, filter) you are investigating. So you can have a single instance that have many "held instances". You can read more about held instance in the online documentation at https://memprofiler.com/online-docs/hel ... tances.htm. The small example program below can be used to illustrate held instances. 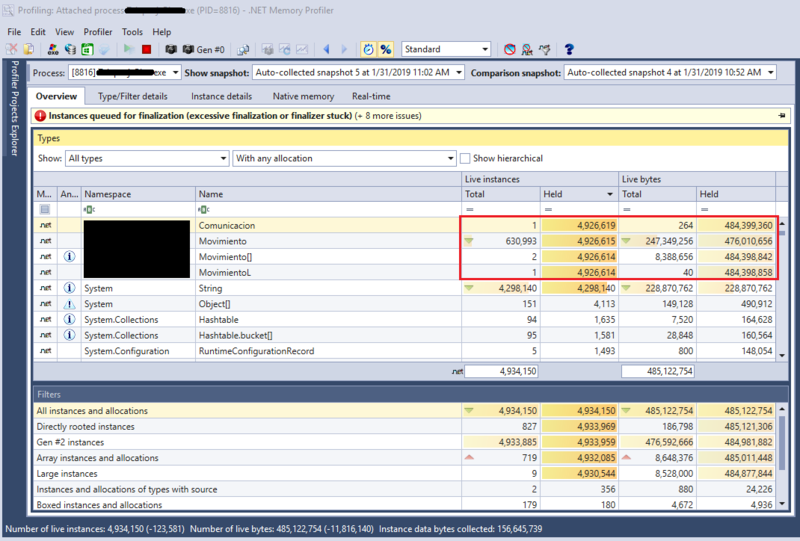 Here you can see that the SomeContainer type with only a single instance holds 1,005 instances. These are the 500 SomeData1 instances, the 500 SomeData2 instances, the List<SomeDataBase>, the SomeDataBase array (used by the list), the SharedData instance, the int array used by SharedData, and the SomeContainer instance itself. In the screenshot you can also see the information for a filter I created ("Derived from 'ConsoleApp1.SomeDataBase'"). 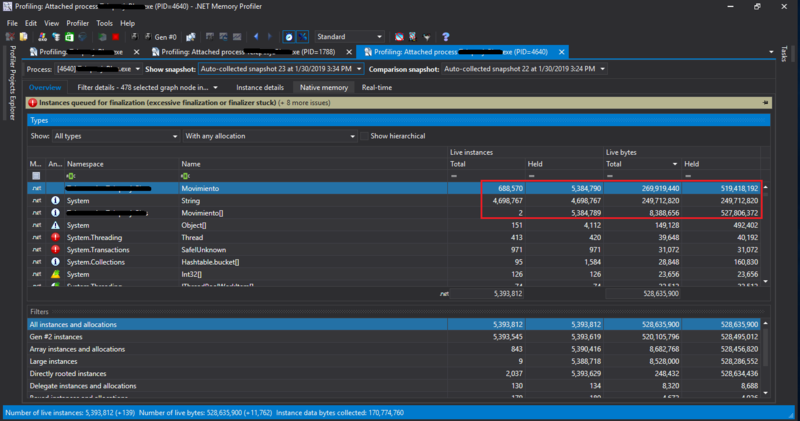 The instances in this filter holds 1,002 instances, even if SomeData1 and SomeData2 only hold 500 instances each. This is caused by the fact that the SharedData instance (and its int array) is held by the SomeData1 and SomeData2 instances, but only when considering all instances at once.